HomeBLOGWhat’s to Know about NBHAAD? National Black HIV/AIDS Awareness Day (NBHAAD) is a longstanding HIV observance, but not all our readers may know how it came about. The planning lead for NBHAAD is the Strategic Leadership Council (SLC). We asked SLC member Deja Abdul-Haqq, Director, Office of Organizational Development, My Brother's Keeper, Inc., about the observance. HIV.gov: Each year, NBHAAD has a particular theme. Please tell us about the theme for 2019 and why it was selected. DA-H: This year's theme - Together for Love – was grounded in CDC’s anti-stigma campaign: Let’s Stop HIV Together. 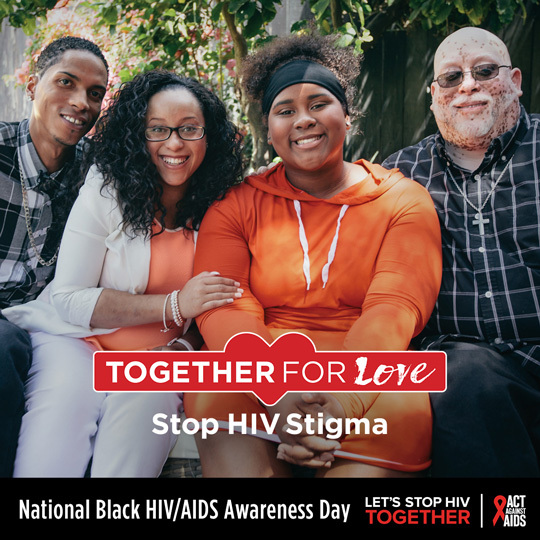 Together for Love enhances the focus on the repercussions of HIV stigma and encourages Black communities to extend compassionate unity to those living with HIV and those who may be at risk. HIV.gov: How do you see individuals and organizations using the theme? DA-H: This year, NBHAAD is encouraging the national community of Black families, youth, faith based organizations, schools, NGOs, CBOs, businesses, and service organizations to be specific and unyielding in its dedication to reducing HIV stigma, increasing HIV testing opportunities, and promoting HIV prevention options among the most vulnerable communities including Black MSM, Black women, youth in urban/rural areas, impoverished communities, and the LGBTQ community. HIV.gov: Can you share a recollection from the early years of developing the observance that our readers may not know? DA-H: When the original NBHAAD observance was celebrated 20 years ago, there were few champions with platforms loud and proud enough to start a sustainable ripple effect. Also, community HIV-prevention efforts were limited to specific geographic locations and champions had limited access to statewide, regional, or national networks of support. HIV.gov: NBHAAD is marked during Black History Month. Is there another facet of the history of NBHAAD that you would like to share? DA-H: Dr. Mark Colomb, (1963-2011), founder of My Brother’s Keeper, Inc., was a founding member of the NBHAAD initiative and instrumental in amplifying the voices of communities of color impacted by HIV. As we mark two decades of this observance, we honor him for his data-driven advocacy that led to creating NBHAAD and to the focus on HIV in the Black and LGBTQ communities as a national emergency. HIV.gov: When did local NBHAAD events start to include HIV testing? DA-H: HIV testing has always been an integral part of NBHAAD observances. Across the country, many organizations started testing at community education events around February 1 this year. Events will happen nationwide throughout the month, and communities are convening to offer HIV tests and information on the latest progress in HIV science, as well as to encourage equity, understanding, and inclusion. National partners – like NASTAD – make it possible for NBHAAD to sustain nationwide testing efforts. HIV.gov: Can you share your thoughts about celebrity involvement in this observance? DA-H: Over the past 20 years, international artists like Hill Harper, Idris Elba, and Sheryl Lee Ralph have been joined in chorus by political and social leaders. Their celebrity and broad platforms have been instrumental in easing the hesitation many communities felt about being involved in the fight against HIV, while also fighting for those living with HIV. Today — when social influencers garner as much attention as national leaders — the community has the power to add its own steam to the engine. We are excited to see the #NBHAAD and #TogetherforLove messages flooding feeds and timelines. HIV.gov: How have you seen communication strategies for the observance change? DA-H: NBHAAD planning started well before the advent of Facebook or social media. So community mobilization strategies were truly old school! We had no idea we would eventually be able to talk with people in the palm of their hands. Keeping younger generations involved and invigorated helps us keep our message intriguing and relevant. The NBHAAD Together for Love campaign encourages individuals and communities of color across generations and regions to promote the Together for Love message on every social platform. And unlike a flyer, or poster, digital messaging is perpetual and easier to share. HIV.gov: Thank you, Deja, for your insights.